Earn up to 88,995 reward points. 16 hot-swappable SASA/SATA 6GB/s disk drive bays with fully redundant power and cooling. Using no cables in the data path and vertically installed disk drives, the BlueStor offers higher performance and signal integrity, with cooler operating disk drives, than any competitive product. BlueStor disk canisters are uniquely designed lightweight, low-cost resin that reduce drive vibration while providing excellent air flow. Each canister features an integrated light pipe, latching handle and single modular EMI shield for the utmost in elegant simplicity. The BlueStor SAS Expander features dual 4x SAS ports for host connectivity and concatenation to additional storage units using low-cost multilane SAS cables. It is compatible with every SAS and SATA-II or SATA-III disk drive on the market today, as well as a long list of compatibility-confirmed host adapters and SAS RAID controllers. 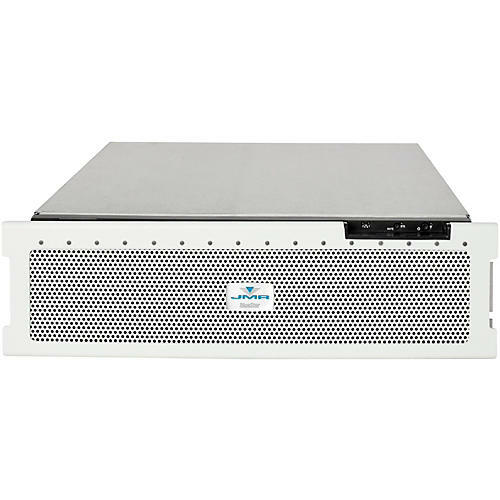 This product includes dual 6Gb SAS expander devices internally with separate connections from HBAs or RAID controllers for the ultimate in data transfer performance. It is normally provisioned with two supplied 6Gb SAS RAID controllers which install in the host work station or server, and two x4 external SAS cables (standard length 2m) for that connection.